PanARMENIAN.Net - Analytical agency TurStat has conducted an online survey to compile a ranking of the most romantic cities in the CIS and neighboring countries for romantic trips of Russian tourists on the weekends. 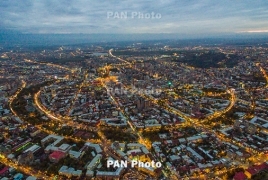 According to the information compiled through the survey, the Armenian capital of Yerevan has also been included in the list of 8 cities. Romantic tourism includes tours and independent trips for two on a weekend. According to the agency, more than 1 million romantic trips are taken in the CIS countries per year. 5% of respondents voted for Yerevan, 33% for Tbilisi, 14% for Astana, Baku and Minsk each, and 10% for Chisinau. Alma-Ata in Kazakhstan and Bishkek in Kyrgyzstan also made it to the ranking of the most romantic cities in the CIS.